Once a creature is tamed as either a pet or mount (not summoned as a minion or familiar) it can become bound to the player using a Soulstone. Bound pets and mounts can be summoned and banished whenever and wherever, however they do use up a Spirit stat which slowly replenishes over time. Bound pets will also have natural health regeneration. New Player Stat - Spirit: Summoned pets and mounts reserve some of the players Spirit, limiting how many pets or mounts a player can have out at once. Spirit also has a slow recharge which will limit how frequently a player can swap pets or mounts. Fixed a crash caused by loading the online donation familiars if the main site is down or not returning a valid data format (JSON). 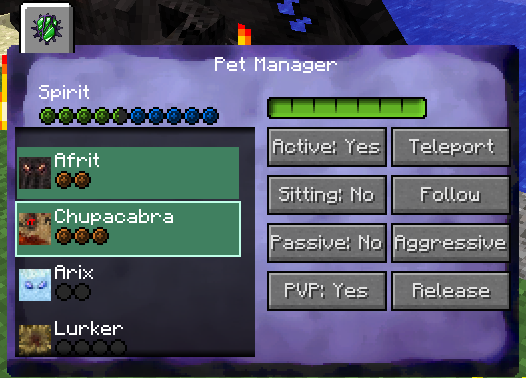 GUI Improvements: Some of the GUIs have been improved and there is now only one inventory tab which will open a new Lycanites Mobs Main Menu which can then be used to access all other GUIs such as the Minion Manager, Mount Manager or Beastiary, etc. Added buttons linking to the mod website and Patreon page. Also added links to creature pages on the mod website from the Beastiary creature pages. Summoned Minions and Familiars now have natural health regeneration. Creatures spawned from Nether Portals are no longer able to travel through them, this will stop Demon Mobs from spawn camping at the Nether! However, if a portal spawned creature is farmed or tamed, it will then be able to go through the portal after a short cooldown. Demonic Lightning Blasts (Cacodemon attacks) and Arcane Laser Storms (Beholder attacks) can now travel through entities without being destroyed. Entities it hits will still take damage but the projectile will continue past the entity until it goes out of bounds or hits a solid block. ============================================================ Lycanites Mobs Update: The Soulstone - Version 1.11.0.0 for Minecraft 1.7.10 Configs older than 1.10.12.0 will be reset. ============================================================ -------------------- New Features: -------------------- New Item Added: Soulstone New Feature - Soulbound Pets and Mounts: Once a creature is tamed as either a pet or mount (not summoned as a minion or familiar) it can become bound to the player using a Soulstone. Bound pets and mounts can be summoned and banished whenever and wherever, however they do use up a Spirit stat which slowly replenishes over time. Bound pets will also have natural health regeneration. New Player Stat - Spirit: Summoned pets and mounts reserve some of the players Spirit, limiting how many pets or mounts a player can have out at once. Spirit also has a slow recharge which will limit how frequently a player can swap pets or mounts. -------------------- Major Fixes: -------------------- Fixed a crash caused by loading the online donation familiars if the main site is down or not returning a valid data format (JSON). -------------------- Changes: -------------------- GUI Improvements: Some of the GUIs have been improved and there is now only one inventory tab which will open a new Lycanites Mobs Main Menu which can then be used to access all other GUIs such as the Minion Manager, Mount Manager or Beastiary, etc. Added buttons linking to the mod website and Patreon page. Also added links to creature pages on the mod website from the Beastiary creature pages. -------------------- Balancing: -------------------- Summoned Minions and Familiars now have natural health regeneration. Creatures spawned from Nether Portals are no longer able to travel through them, this will stop Demon Mobs from spawn camping at the Nether! However, if a portal spawned creature is farmed or tamed, it will then be able to go through the portal after a short cooldown. Demonic Lightning Blasts (Cacodemon attacks) and Arcane Laser Storms (Beholder attacks) can now travel through entities without being destroyed. Entities it hits will still take damage but the projectile will continue past the entity until it goes out of bounds or hits a solid block.